Recap Numero DOS!! Ok, there is still sooo much I could say about this retreat! But instead, I’ll let some of the girls tell you about…I copied and pasted exactly what they wrote…grammar and all! LOL! Seriously, I hope you will pray now about joining in on our next Girls Retreat….and well all of our upcoming uber fun Girls Ministry events! "I LOVED the Girls' Retreat! It was such a sweet time to get to know everyone, the younger girls especially, and become a huge family with all the girls and leaders. We were filled to overflowing with Truth in every session and worship service we went to. Before going, I was in such a rut in my walk with the Lord, but He refreshed me and spoke love to me in a new way. :) I am very excited to see how the outcome of this retreat will affect how powerfully God can use us as a girls' ministry." "I took a lot away from the girls' leadership retreat and met some really cool younger girls AKA little sisters. I LOVED Melissa and Sissy! One thing they said that really stuck with me was when they were talking about maps and mirrors. They were talking about when someone talks about a certain subject (divorce, depression, cancer, etc.) and something inside of you starts to stir, we can use those "stirrings" to minister to others and feed off of those feelings to minister in a special way. I really liked the how to pray session and the life after high school session and the big sis little sis session. They were great! I think my favorite part of the retreat was getting to be away from the world for a little while to just spend sweet, uninterrupted time with Jesus and some younger girls on the trip. They are an extremely special group of girls and I wouldn't have gotten to know them as well as I did if I hadn't gone on the trip and been open to get to know them." "I learned this weekend that i need to be more alert. there are so many things that i miss that come from God. i was listening to erin davis in the main service before our break out . she was not supposed to speak . but the people that were going to talk couldnt because the girl had her baby a day before so they asked erin to speak and i was set on going to a different seminar but when i heard erin speak it was so amazing. :) her seminar was called dealing with the inner diva but i thought i didnt have any inner diva but actually it spoke to me in a different way. this weekend was so much fun. all the girls bonded it was so awesome. i am only in 6th grade but i also learned that i can impact older and younger kids. and i also cant thank miss suzanne enough she is an amazing leader shes awesome!!!" "I went into this retreat just kinda expecting it to be another retreat. This retreat was so much more personal and was such a refreshing experience. I loved having the option of choosing which sessions I attended, because that allowed it to fit more to my needs. It was also a great time of fellowship and a great opportunity to connect with the younger girls. I absolutely loved it and I'd go again in a heartbeat!!" 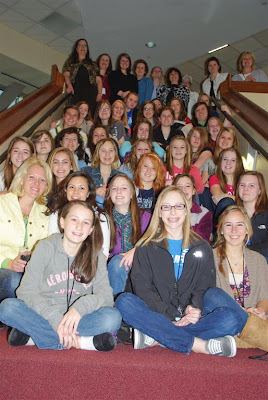 "The girls retreat that I went on, Girl's Ministry Forum, was a.m.a.z.i.n.g.! While I was there, two things really stood out to me out of the whole thing. One of the things, was how much God loves each of us! I always knew God loved me, but when I found out that God loves me the exact same amount as He loves Jesus, I was sooooo amazed. One of the other things that amazed me was how the devil gets into our heads. I learned that when I do have a sinful thought, I need to recognize that is is sinful and get read of it and not keep thinking about it." Wanna see more pictures?! Check out the Girls Ministry Facebook Page!